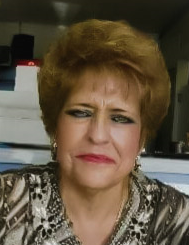 Carmen B. Morales, 64, of Dallas Place, Carlsbad, New Mexico, passed away Tuesday, January 29, 2019 at her home. Visitation will be 2:00 PM – 5:00 PM, Monday, February 4, 2019 at Denton-Wood Funeral Home. A vigil is scheduled for 7:00 PM, Monday, February 4, 2019 at Denton-Wood Funeral Home Chapel. Mass of Christian Burial is scheduled for 10:00 AM, Tuesday, February 5, 2019 at San Jose Catholic Church with Fr. Martin Cordero officiating. Interment will follow in Carlsbad Cemetery, Carlsbad, NM. Denton-Wood Funeral Home is in charge of the arrangements. Carmen was born September 9, 1954 in Juarez, Chihuahua, Mexico to Aurelio and Maria Elena (Salcido) Bejarano. She moved to Carlsbad in 1990. Carmen met Bernie Morales, Sr., in 1998 and married July 24, 2002 in Las Vegas, NV. She owned and operated Carlsbad Beauty Supply and Fiesta Restaurant over 17 years. Carmen was honored by President George W. Bush as Hispanic Female Woman of the Year in 2004. She was known for her generosity and enjoyed her customers and relationships at the restaurant. Carmen was preceded in death by her parents. Survivors are her husband, Bernie Morales, Sr., of Carlsbad, NM; children: Roberto A. Chavez of Carlsbad, NM, Anabel Haddo and husband, Daniel of Savanah, GA, Janeth Valenzuela of Carlsbad, NM, Yvette Harvey and husband, Frank of Houston, TX and Bernie Morales, Jr. and wife, Sarah of Carlsbad, NM; grandchildren: Zoraida Chavez, Joe Rob Haddo, Justin Haddo, Harmony Liddel, Haley Back, Adan Alvarado, Adrian Alvarado, Selyna Morales, Jordan Morales, Makayla Lopez and Markus Morales; 4 great-grandchildren; siblings: Lupe Bejarano Moreno, Luz Elena Chavez, Rafa Chavez, Josefina Muñoz and numerous nieces and nephews.